I read this article and thought it was brilliant, thought it might be something for you. 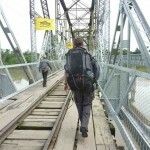 The article is called Bocas to San Jose – a note on border crossings… and is located at https://timeasatraveller.com/bocas-to-san-jose/. Border Crossings…. The intrigue, The mystery…. the unknown… Oh how I love border crossing days. You never really know how your day is going to pan out and how long it will take to get from A to B… or if you’ll even be allowed into B at all. You’re entirely at the mercy of the border guards and what law they’d like to enforce on that particular day. These can vary from official to … a random array of anything that sounds like it could be official. Then there’s the space in between each border crossing, No Man’s Land, nothing really instills intrigue like the name ‘No Mans Land’, especially when the amount of time you will spend in this land of no men is undetermined. Then there’s the second border crossing, which has the same random array of official and non-official rules as the first border crossing only the country has a different name. Then there are the fees to get out of one country and into the other and the currency each will take, which also varies depending on the border guard. Confused? Of course. Now picture carrying all your worldly possessions on your back and standing in the blazing heat in long lines of people with the same hopes, aspirations, and potential for failure as yourself. And you have BORDER CROSSING DAY. 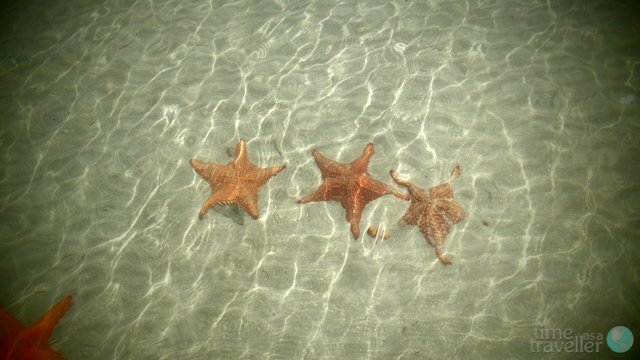 We were in Bocas del Toro, on the Caribbean coast of Panama. 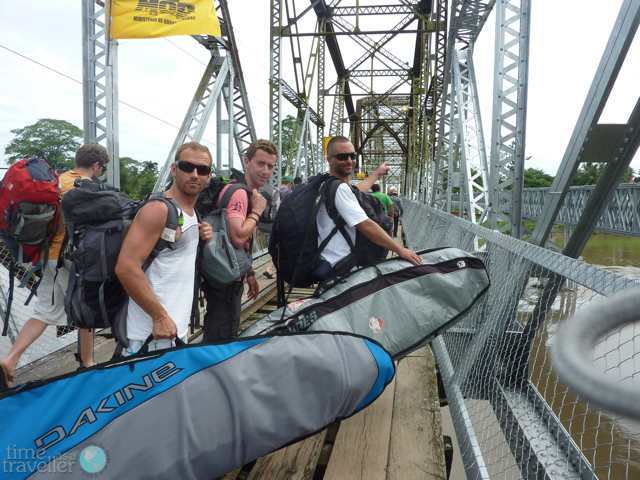 We wanted to get over to Santa Teresa, on the Pacific coast of Costa Rica… in one day. Possible?? Not really, but we decided to see how far we could get by nightfall anyway. It was raining the day we left Bocas del Toro. That perfect mix of rain and emotion that seals in all the goodness of such a perfect place and lets you know that it’s time to move on, leaving you feeling that it really was a once in a life time experience that must be left as such. On a tropical island, Rain is the catalyst. The snow globe is sealed, you pick up your pack and move on with fond memories. Knowing we’d be in for a full day on the road, and in an attempt to make it as far as possible, we had organized our exit the afternoon before. After asking around town we found a guy in the street on a bike who sold us tickets which would take us direct to San Jose for $30 each. He organised to come back to collect us in the morning and assured us that we’d make it in time for the last bus out of San Jose to Santa Teresa. We knew that was too good to be true but oohed and ahhed appropriately and with enough excitement that he would feel like he had said the right thing, and quietly grabbed a flyer for a hostel in San Jose just in case. 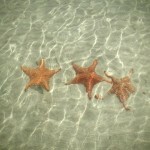 So it was 8am when we left Bocas del Toro. It was raining. 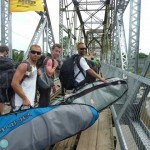 We had one new travel buddy, Dave -Anthony’s new found surfing buddy, and Dave’s surf board. The four of us squashed into the back of a taxi with all our backpacks piled into the front seat in an attempt to keep our gear dry in the pouring rain. At the dock we boarded a small boat pilled high with backpacks and made our way back over to Almirante, then onto a minibus out to the border. Back to the border crossing. Exiting Panama is pretty straight forward. You line up, your passport is stamped, and off you go. 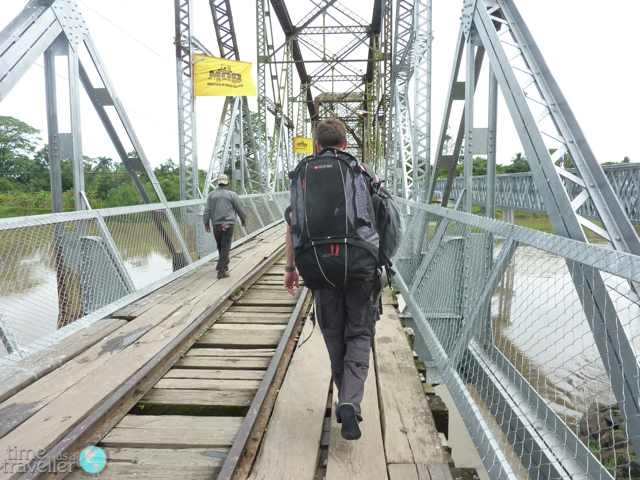 The crossing is everything you picture a border crossing to be, an old bridge in a state of disrepair over a raging river, that you walk over that little bit faster just in case that ‘one time’ happens to be your time and you appear on the front page of your local newspaper back home. Entering into Costa Rica overland is one of those border crossings where they may ask to see an exit ticket prior to entering, and a “we’re just going overland into the next country” isn’t an optional answer. The last time I came through this border crossing was back in 2010 when you could we print off an itinerary from American Airlines prior to paying for the ticket, and that was proof enough for the border guard. Not so any more (American Airlines have made changes to their site). The main upside of taking a bus that goes from Panama through to San Jose in Costa Rica (rather than just dropping you at the border) is that rules such as these are often overlooked due to the large group. Everyone’s passports are taken, stamped, and off you go. The main down side of this, however, is that you must wait for everyone… often in a long line… in the blazing heat. In perfect place of back of the queue we did just that for about an hour until we made it to 4th from the front, when the driver took our passports, marched into the office, and arrived back minutes later with them all stamped and ready to go… and no mention of exit tickets (success on option 2). The rest of the ride into San Jose took the majority of the day. It was hot and sticky but the windows opened and we stopped off a few times picking up people along the way. We finally made it into San Jose at about 5pm, and were dropped off at a busy street corner before tying the surf boards to a taxi roof, glad we had a name of a hostel in our hands. 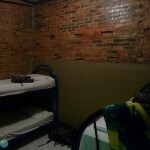 We spent the night in a dungeon room at Hostel Pangea. 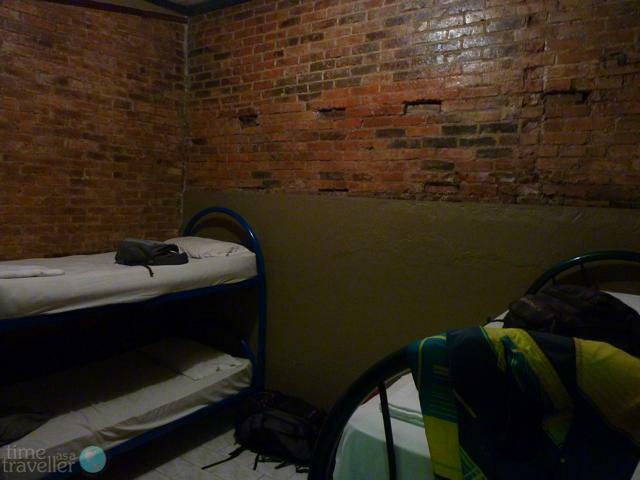 I had been to this hostel before. It’s one of those ‘conveyor belt’ hostels, that’s nice and pretty but overpriced and sees you as nothing but a number that must abide by a set of rules, but all I wanted was a clean, safe bed for the night, a bit of wifi, and hopefully some hot water. We got all of the above (except for the hot water, that was a bit of an outside expectation though), and after a full day on the road we happily chilled out in comfy hostel luxury for the evening.